This week I had a 3-day jury trial. When it was completed, I walked out of the courthouse but my client did not. In such criminal cases, at the brink of trial, it is common that the plea discussions give an accused serious pause. 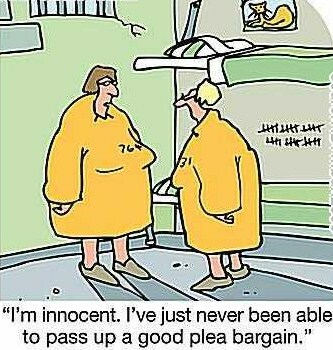 Rejection of a reasonable plea offer can result in significantly more time in prison thus, the stakes are high. The counsel-driven plea process is at the heart of a Michigan case up for oral argument this week at SCOTUS: Lafler v Cooper. The case comes from the Wayne County Circuit Court; straight out of the Frank Murphy Hall of Justice. The female victim in the case was shot 4-times by Anthony Cooper: twice in the buttocks, once in the abdomen, and once in the hip. She survived these gunshot wounds. Cooper’s lawyer rejected a plea offer that would have capped his prison term to the lower end of his sentencing guidelines on an attempted murder charge. The offer was rejected on grounds that the medical evidence in the case would demonstrate that Cooper was only trying to maim his victim; not kill her. Counsel pushed for a reduction of the charges to assault with intent to do great bodily harm. After his jury trial conviction, Mr. Cooper was sentenced to 135-360 months in prison. On appeal, he raised a claim that he received ineffective assistance of counsel during the plea bargain phase of his case in contravention of his rights under the Sixth Amendment to the U.S. Constitution. With his appeals exhausted in the state courts, Cooper filed a petition for Habeas Corpus in federal court. The federal court ruled that the state appellate court erred by not accounting for the “affirmatively deficient advice” of Cooper’s trial counsel in rejecting the prosecutor’s initial plea offer. The remedy: the federal court ordered specific performance of the initial plea offer: i.e. a 50-month prison term. Understandably, the prosecutor appealed hence, the case now resides on the SCOTUS docket.